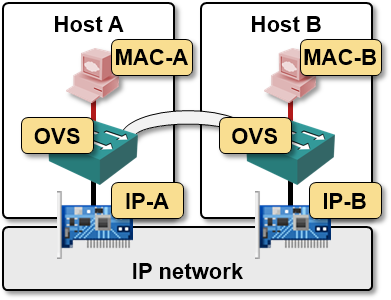 In the previous posts I described how a typical overlay virtual networking data plane works and what technologies vendors use to implement the associated control plane that maps VM MAC addresses to transport IP addresses. Now let’s walk through the details of a particular implementation: Nicira Network Virtualization Platform (NVP), part of VMware NSX. 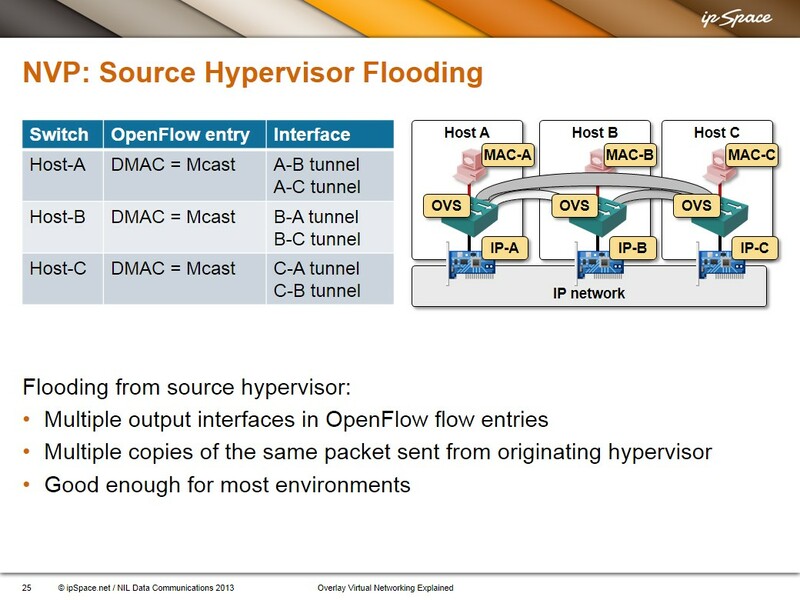 Nicira NVP currently relies on Open vSwitch (OVS) to implement hypervisor soft switching. OVS could use dynamic MAC learning (and it does when used with OpenStack OVS Quantum plugin) or an external OpenFlow controller. User-space OVS database (ovsdb) daemon that keeps track of the local OVS configuration (bridges, interfaces, controllers …). NVP uses a cluster of controllers (currently 3 or 5) to communicate with OVS switches (OVS switches can connect to one or more controllers with automatic failover). It uses two protocols to communicate with the switches: OpenFlow to download forwarding entries into the OVS and ovsdb-proto to configure bridges (datapaths) and interfaces in OVS. Let’s start with a simple two host setup, with a single VM running on each host. The GRE tunnel between the hosts is used to encapsulate the layer-2 traffic between the VMs. 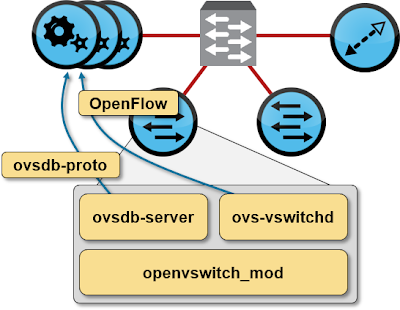 NVP OpenFlow controller has to download just a few OpenFlow entries into the two Open vSwitches to enable the communication between the two VMs (for the moment, we’re ignoring BUM flooding). NVP controller downloads new flow entries to OVS switches on all three hosts. If the above description causes you heartburn caused by ATM LANE flashbacks, you’re not the only one ... but obviously the number of solutions to a certain networking problem isn’t infinite. You can also tell the NVP controller to use source node replication – the source hypervisor sends unicast copies of an encapsulated BUM frame to all other hypervisors participating in the same virtual segment. To learn more about Nicira NVP and VMware NSX, register for the free VMware NSX Architecture webinar. To get a bigger picture, start with Cloud Computing Networking webinar, and register for the Overlay Virtual Networking one. Flooding BUM traffic via unicast tunnels points to scalability issues (that's why people invented Multicast), and using Service Node sounds like an old-fashion thing to do (still in my mind, better than flooding). Do you think solutions like BGP/MPLS based Ethernet VPN are also better suited to Data Centre fabric environments? "that's why people invented Multicast" - good luck with that line in most DC environments. Why do you think Cisco implemented unicast VXLAN? In a data center with hundreds of hosts, do I have an impossibly high number of GRE tunnels in the full mesh? Are there scaling limitations to this approach? Also - how does the OpenSwitch come to know about mac addresses it may like to reach that are not part of the mesh (e.g. devices not running NVP)? Q#2: Unknown MAC addresses might happen only if you have a L2 gateway attached to the overlay subnet. 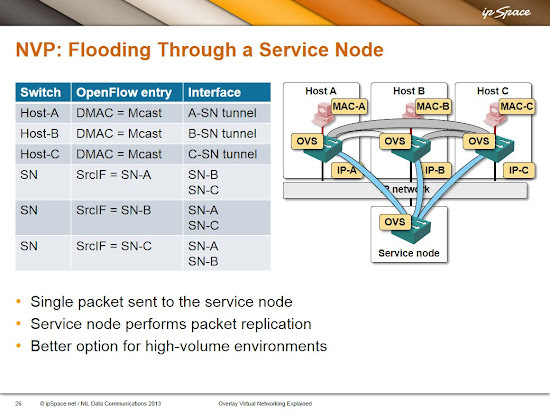 In that case the L2 gateway node and the service node perform dynamic MAC learning and all other transport nodes (hypervisors) send packets to service node for unknown unicast flooding. Ivan, how do you know so much? A few decades spent trying to figure out how things work (and why they work that way) help ;) After a while, everything looks a deja-vu all over again. Is it necessary for controller cluster to have 3 nodes ?. So far it's my understanding the answer is "Yes". NVP use(d?) Paxos and you need at least 3 nodes to make a voting protocol meaningful.